Saint Lucian was born at Samosata in Syria. 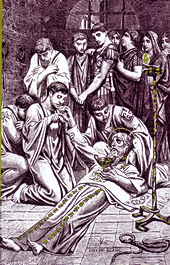 Having lost his parents in his youth, he distributed to the poor all his worldly goods, of which he had inherited an abundant share, and withdrew to Edessa, to live near a holy man named Macarius, who imbued his mind with a knowledge of Holy Scripture and led him to the practice of the Christian virtues. Having become a priest, his time was divided between the external duties of his holy state, the performance of works of charity, and the study of sacred writings. Saint Lucian revised the books of the Old and New Testaments, expunging the errors which had found their way into the text either through the negligence of copyists or the malice of heretics. His translation of the Hebrew Bible into Greek was universally esteemed and was very useful to Saint Jerome, for whom he prepared the way. Soon afterwards the latter was to give to the world the Latin translation of the Bible known as the Vulgate. Having been denounced as a Christian during the persecution of Maximin, Lucian was thrown into prison and condemned to torture, which was protracted for twelve whole days. A group of Christians visited him in prison on the feast of the Epiphany, and brought bread and wine to him; while bound and chained down on his back, he consecrated the divine mysteries upon his own breast, that the faithful who were present might receive Holy Communion. He finished his glorious career in prison, and died with the words, I am a Christian, on his lips. Reflection. If we would keep our faith pure, we must study its holy truths. We cannot detect falsehood until we know and love the truth; and to us the truth is not an abstraction, but has become incarnate in a Person, Jesus Christ, God and Man. Little Pictorial Lives of the Saints, a compilation based on Butler's Lives of the Saints and other sources by John Gilmary Shea (Benziger Brothers: New York, 1894); Les Petits Bollandistes: Vies des Saints, by Msgr. Paul Guérin (Bloud et Barral: Paris, 1882), Vol. 1. The zeal for Thy house has eaten Me up.